Find out what our experts have to say about Royal Enfield Thunderbird 350! The Royal Enfield Thunder 350 is a motorcycle that is built for munching miles on the highway. The comfortable riding posture, projector headlight and rear disc brake make touring on the motorcycle effortless. The Thunderbird 350 can be handful in the city to ride and getting used to and we also desired better refinement from the motor. 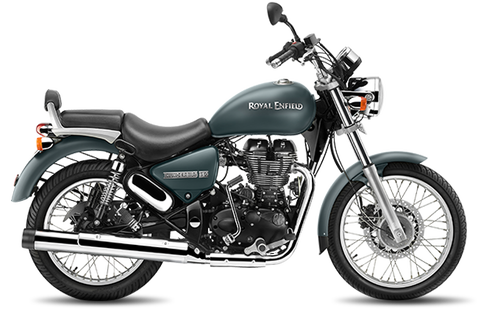 The least priced variant is Royal Enfield Thunderbird 350 STD priced at Rs. 1,72,259 and the most priced variant is Royal Enfield Thunderbird 350 ABS priced at Rs. 1,77,484. Choose the Royal Enfield Thunderbird 350 which fits the bill of you. The Royal Enfield range of motorcycles reminds of retro styling, some thrilling horsepower, and that unmistakable hum of the engine. Not for nothing, Royal Enfield is counted among the most well-known bike makers in the world. The company makes the Thunderbird range of bikes exclusively for India and none of them have ever been exported. The Thunderbird is a mid-premium range cruise bike that sports the signature Royal Enfield styling and a high-performance engine. The Thunderbird 350 was introduced in the Indian market in 2000 and was last revamped in 2012. The bike is a bread and butter product of Enfield and has been branded as a budget cruiser. It’s a conscious effort by Enfield to bolster its presence in the Indian market. Over the years, the company has become synonymous with vintage styling on its bikes, highlighting a golden heritage, with a right mix of modern technology. The bike is available in three attractive shades of black-matte, glossy and loss, and twilight (black with a hint of blue). The distinctive styling and 3D motifs are all typical of Royal Enfield. The vehicle manages to forge a commanding position on the road. The Thunderbird is among the oldest series of bikes sold by Royal Enfield and has been on Indian roads for over 15 years. It is powered by the same 346cc engine which is used in all 350cc bikes in Enfield’s portfolio. The bike has undergone some cosmetic changes from its earlier version, like the digital instrument cluster, teardrop fuel tank, and LED tail light. It returns a mileage of around 43kmpl, which is pretty decent for a cruiser bike. The Thunderbird is priced at ?1.57 lakhs (ex-showroom). Its closest competitors are the KTM Duke 390, Bajaj Avenger 220 Cruise, Mahindra Mojo, and Honda CBR250R. The Thunderbird conforms to the vintage style design aesthetics of the Royal Enfield brand which the company so proudly upholds. There’s no unnecessary styling, unlike its newer peers that don a more intricate framework. The oversized fuel tank, wide rider seat, and the upright driving position bring prominence to the bike’s design. While chrome has been generously used, it doesn’t look overboard. The company, in fact, has smartly used chrome on the body to skew focus on easily visible parts. Both multi-spoke wheels are traditional Royal Enfield design. The seat design is a bit dated but the company manages to overcome that with the fit, finish, and quality. Power to the Thunderbird 350 is served by a single cylinder 346cc air-cooled engine that delivers 19.8bhp at 5350 rpm. The torque peaks out at 28Nm at 4000rpm which is pretty good considering the 195kg kerb weight of the bike. But the Thunderbird 350 still has a low power to weight ratio that affects performance. Unlike its elder sibling, the Thunderbird 500 which has electric start, the engine of the Thunderbird 350 operates on a carburettor. It is mated to a five-speed gearbox. The 280mm and 240mm disc brakes on the front and rear wheels respectively, take care of the braking duties. The hazard light, the first on any Indian motorcycle, and the retractable foot pegs enhance the safety quotient of the vehicle. The 41mm telescopic fork suspension in the front and the twin gas charged shock absorbers with 5-step adjustable preload ensure proper negotiation of bumpy roads. But the suspension system is not retentive which results in a poor ride quality. That aside, turning sharp bends is a problem, courtesy the heavy weight of the bike. The seat is uncomfortable and adds to the biker’s woes. The vehicle feels lethargic during acceleration. The Thunderbird rests on multiple spoke 19-inch 90/90 wheels in the front and 120/80 wheels at the back. The tyres provide good on-road riding grip. Braking is instant with the twin disc brakes. The twin-pod instrument cluster reveals the average fuel economy and houses an odometer, tripmeter, and analogue speedometer. Other features include an engine kill switch, low oil indicator, fuel warning indicator, low battery indicator, fuel gauge, and a grab rail for the pillion. The Thunderbird is a favourite of cruising enthusiasts. It’s not much of a city bike. But all Royal Enfield bikes have enjoyed a cult following in India and the Thunderbird lives up to it.